Samuel Taylor Coleridge (October 21, 1772 – July 25, 1834) was an English lyric poet and essayist, described by John Stuart Mill as one of the seminal minds of his age. The son of an Anglican clergyman, Coleridge became a Unitarian, entering the ministry in 1798, although later in life he rejected Unitarian theology as incompatible with Christian belief. Coleridge's close friendship with the poet William Wordsworth resulted in the joint publication, Lyrical Ballads, a landmark work that led to the emergence of the Romantic Movement in England. The poets sought to move beyond the formal restraints of eighteenth century English verse to emphasize the vitality of everyday life, the universality of human emotional experience, and the illuminating power of nature. Coleridge's "Rime of the Ancient Mariner," the first and longest poem in the volume, was inspired by British explorations of the polar regions and combined vivid nature imagery with the supernatural in a perplexing allegorical tale of redemption that has fascinated readers to the present day. Although known primarily as a poet, Coleridge also produced influential works on politics, philosophy, and theology. His lectures on Shakespeare established him as one of leading literary critics of the Romantic era. Coleridge suffered chronic neuralgic pain and became addicted to opium. His much-admired poem "Kubla Khan" was inspired by a dream vision in an opium-induced state. His addiction and pain led to near suicide, separation from his wife, and estrangement from his children. In his later years he lived in the household of his physician and enjoyed an almost legendary reputation among the younger Romantics. Samuel Taylor Coleridge was born in Ottery St Mary, the son of a vicar. After the death of his father, he was sent to Christ's Hospital, a boarding school in London. In later life, Coleridge idealized his father as a pious innocent, but his relationship with his mother was difficult. From 1791 to 1794, he attended Jesus College at the University of Cambridge, except for a short period when he enlisted in the royal dragoons. At the university he encountered political and theological ideas that were then considered radical. He left Cambridge without a degree and joined the poet Robert Southey with a plan, soon abandoned, to found a utopian communal society, called pantisocracy, in the wilderness of Pennsylvania in the newly founded United States of America. In 1795, the two friends married sisters Sarah and Edith Fricker, but Coleridge's marriage proved unhappy. Southey departed for Portugal, but Coleridge remained in England. That same year, Coleridge met poet William Wordsworth and his sister Dorothy. They immediately became friends, and their correspondence would form one of the richest intellectual partnerships of the Romantic era. Beginning in 1796, Coleridge started using opium as a pain reliever. His and Dorothy Wordsworth's notebooks record that he suffered from a variety of medical complaints, including toothache and facial neuralgia. While there was little stigma associated with taking opium then, there was also little understanding of the physiological or psychological aspects of addiction. The years 1797 and 1798, during which Wordsworth and Coleridge lived in Nether Stowey, Somerset, were among the most fruitful of Coleridge's life. Besides the The Rime of the Ancient Mariner, he composed the symbolic poem "Kubla Khan," which was written—Coleridge himself claimed—as a result of an opium dream, in "a kind of a reverie;" and the first part of the narrative poem, Christabel. During this period he also produced his much-praised "conversation" poems This Lime-Tree Bower My Prison, Frost at Midnight, and The Nightingale. In 1798, Coleridge and Wordsworth published a joint volume of poetry, Lyrical Ballads, which proved to be the starting-point for the English Romantic movement. Though the productive Wordsworth contributed more poems to the volume, Coleridge's first version of The Rime of the Ancient Mariner was the longest poem and drew more immediate attention. In the autumn of 1798, Coleridge and Wordsworth left for a stay in Germany; Coleridge soon went his own way and spent much of his time in university towns. During this period he became interested in German philosophy, especially the transcendental idealism of Immanuel Kant, and in the literary criticism of the eighteenth-century dramatist Gotthold Lessing. Coleridge studied German and, after his return to England, translated the dramatic trilogy Wallenstein by the German Classical poet Friedrich Schiller into English. In 1800, he returned to England and shortly thereafter settled with his family and friends at Keswick in the Lake District of Cumberland. Soon, however, he fell into a vicious cycle of self-doubt, ill health, and increased opium dependency. Between 1808 and 1819, Coleridge gave a series of lectures in London and Bristol; those on Shakespeare renewed interest in the playwright as a model for contemporary writers. Coleridge's lectures were so popular that it was considered a rite of passage for any aspiring intellectual to travel to London and hear Coleridge read. One such intellectual who did precisely that was Ralph Waldo Emerson, who, afterward, would devote his life to the literary arts. In 1816, Coleridge took residence in the home of the physician James Gillman, in Highgate. In Gillman's home he finished his major prose work, the Biographia Literaria (1817), a volume composed of 25 chapters of autobiographical notes and dissertations on various subjects, including some incisive literary theory and criticism. The sections in which Coleridge expounded his definitions of the nature of poetry and the imagination are particularly important, laying out the division between true imagination and mere fancy that was to influence writers well into the Victorian period. He published other writings while he was living at the Gillman home, notably Sibylline Leaves (1817), Aids to Reflection (1825), and Church and State (1830). He died in Highgate on July 25, 1834. Coleridge is probably best known for his long narrative poems, The Rime of the Ancient Mariner and Christabel. Even those who have never read the Rime have come under its influence: Its words have given the English language the metaphor of an albatross around one's neck, the (mis)quote of "water, water everywhere, but not a drop to drink," and the phrase "a sadder but wiser man." Christabel is known for its musical rhythm and Gothic horror. Both poems exhibit what Coleridge and Wordsworth set out to achieve in the Lyrical Ballads: A triumph of the imagination over the dull poverty of the mind. However, in stark contrast to Wordsworth's poems, Coleridge's project a wild and truly imaginative universe, where seemingly impossible things happen, all of which is a far cry from Wordsworth's attempts to render humble life "in the language really used by men." In contrast, a poem like The Rime of the Ancient Mariner is the outlandish story of a sailor who, after killing a symbolic albatross, condemns himself and his shipmates to death on a motionless sea, where they sat "idle as a painted ship / upon a painted ocean." Death arrives on a ghostly ship, and takes the lives of all the crew but that of the eponymous mariner, who is cursed to wear the albatross about his neck and live aboard a ship of corpses. Then the moon—Coleridge's symbol of the imagination—appears and reanimates the mariner's crew; the ghosts sail the ship back to land where the mariner washes ashore, to tell his tale to anyone who passes. In Coleridge's hands a poem such as this, though wildly fantastic, does not devolve into mere fantasy. As in his other strongest poems, The Rime of the Ancient Mariner is profoundly moving and engrossing, affecting a complete suspension of disbelief in the reader. "Kubla Khan," or "A Vision in a Dream, A Fragment," although shorter, is also widely known and loved. It consists of strange collage of dream-like imagery, beginning with a description of a mythical palace built by Kubla Khan, and moving rapidly into a vortex of imaginative and seemingly unrelated scenes. The poem is renowned for its exquisite metrical flow and creativity. Many poets who succeeded Coleridge—among them future poet laureate Alfred Lord Tennyson—would cite "Kubla Khan" as the most beautiful poem written in the English language. Coleridge's shorter, meditative "conversation poems," however, proved to be the most influential of his work, perhaps because his other poems have proven so difficult to imitate. These include both quiet poems like “This Lime-Tree Bower My Prison” and “Frost at Midnight,” and also strongly emotional poems like “Dejection” and “The Pains of Sleep.” Wordsworth immediately adopted the model of these poems, and used them to compose several of his major poems. Via Wordsworth, the conversation poem became a standard vehicle for English poetic expression, and perhaps the most common approach among modern poets, most especially Frost, who indebted himself directly to Wordsworth. Although known today primarily for his poetry, Coleridge also published essays and books on literary theory, criticism, politics, philosophy, and theology. He introduced Immanuel Kant to the British public in his lectures and "Thursday-night seminars" at Highgate. Coleridge's treatment of the German idealist philosophers in the Biographia Literaria has been subject to the accusation of plagiarism. It is known that he presents lengthy translations, particularly from Schelling, as his own work. Thomas de Quincey compares this to kleptomania, although Coleridge's defenders attribute it to his poor organization of notes rather than dishonesty. He wrote both political commentary and hack journalism for several newspapers, especially during the Napoleonic wars. He translated two of Schiller's plays from the German and himself wrote several dramas (Zapolya had successful runs in London and Bristol). He also worked as a teacher and tutor, gave public lectures and sermons, and almost single handedly wrote and published two periodicals, the Watchman and the Friend. During his life, he was also famous as a conversationalist. His letters, Table Talk, and range of friends reflect the breadth of his interests. In addition to literary people such as William Wordsworth and Charles Lamb, his friends included Humphry Davy the chemist, industrialists such as the tanner Thomas Poole and members of the Wedgwood family, Alexander Ball (the military governor of Malta), the American painter Washington Allston, and the physician James Gillman. Coleridge's contributions to fields ranging from philosophy to theology and biology continue to be studied, and Coleridge's immense talents as a poet place him in the pantheon of the Romantics despite his relatively small output. His eclectic and voracious intellect perhaps pushed him too far, and it is unfortunate that in his rather erratic life we do not have a more complete treatise on Coleridge's outlook. Still, his esteem among scholars of all fields continues to rise, and it is now generally acknowledged that Coleridge was much more than just a minor poet of the Romantic Movement. It is in Coleridge, more than any other thinker of his generation, that we see the foreshadowing of contemporary thought. de Quincey, Thomas. Recollections of the Lakes and the Lake Poets. ISBN 0140439730. Homles, Richard. Coleridge: Early Visions. New York: Viking, 1990. ISBN 0375705406. 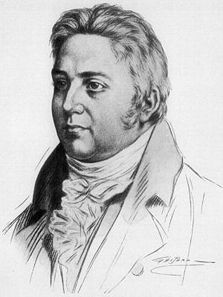 History of "Samuel Taylor Coleridge"
This page was last modified on 4 June 2013, at 14:16.